The finale of the latest season of "The Amazing Race" will be broadcast Sunday night. 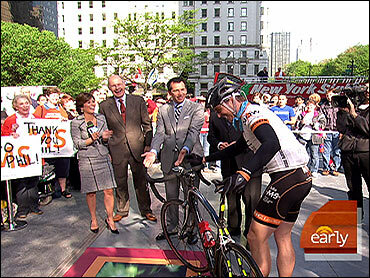 Call it coincidence -- or the successful execution of perfectly planned timing -- but "Race" host Phil Keoghan concluded an amazing journey of his own Friday -- crossing the finish line in The Early Show plaza of a 3,500 mile, cross-country bike ride that raised funds for Multiple Sclerosis research. His "Ride Across America" kicked off March 28 in Los Angeles and took him through 39 cities over those 45 days. The ride was sponsored by GNC. Keoghan raised $400,000 in all. That works out to more than $100 per mile! He says the best part of the trip was the thousands and thousands of people he and his fellow riders met along the way. "Amazing Race" fans came from everywhere to show their support. People who live with MS every day were in each of the cities, rooting them on. The worst part? Getting sick in Nebraska and having to go to an emergency room and have saline drips, then having to get up the next morning and pump out 100 miles with essentially little or no water. He couldn't stomach anything. It was, says Keoghan, definitely the hardest physical challenge of his life. He averaged 100 miles a day which, he concedes, gets pretty grueling after awhile.